Alexander - the great - discovers Noggin. Meanwhile Charles Clarke read Oldknow & Taylor- and then sadly moved on. Perhaps he thought it was a load of Soddy spheres?? Latest addition : Becta have commisioned a number of articles about using ICT in subject teaching, and I was asked to write the maths one: "It's 2008 - So what you got to offer, then? - Using ICT to put learners in touch with mathematics". You can download the Word file here (3.5 Mb) or the Acrobat file here (pdf 2.3 Mb). The ATM have also recently published my article "Cubism and Cabri" in Mathematics Teaching MT206. You can download the Acrobat file here (pdf 1 Mb), a zip of associated files for Cabri II Plus and Cabri 3D here (zip 231 kb) and a zip of jpg image files here (zip 708 kb). Recent talks and conferences: At this year’s BETT 2008 show at London Olympia I gave two seminars on Thursday 10th January. The first was in the Software Zone, entitled Modelling with Cabri. You can download the Word file here (2Mb), and also zips of the Cabri II Plus files (4Mb), Cabri 3D files (400kb) and their html equivalents (1.6Mb). The second was in the Training Zone, and was the Mathematical Association seminar. You can download the Word file here (2Mb) and a zip of the associated files (2Mb). I have been asked to chair the NCETM’s first conference on ICT and mathematics at the Westminster Central Hall, London on March 12th – see the NCETM portal for details. I will be doing two presentations at the joint mathematical associations’ Easter conference `Joined Up Mathematics’ at Keele, 2nd-5th April. I will also be giving a plenary address at the 13th Asian Technology Conference in Mathematics ATCM in Bangkok, December 15th-19th. On 30th October 2007 I gave a presentation at the French mathematics teachers’ (APMEP) conference in Besançon and you can download the Powerpoint of `Les TIC en Angleterre dans l’enseignement des mathématiques’ (1.7Mb). On 13th October I gave a presentation `ICT bringing science and mathematics to life’ to Belgian science teachers in Aalst and you can download the Word document here (1.7Mb). On 12th October 2007 I gave a presentation at the Hand-held Learning conference in London. The Powerpoint for `New developments in handhelds for mathematics, science and technology cooperation’ is available from this link. Current work : The Mathematical Association has been working with Steljes Ltd, the UK distributor of SMARTBoards, on a set of 18 lesson ideas and resources collected as SMART Notebook files, with pdf documentation. The first batch of 7 of these were launched on CD by Steljes at BETT 2007 but are not currently available. You can download an example file and accompanying pdf document here. We hope that shortly all these materials will be available through the SMART Technologies communities website. The MA has also worked with Steljes Training to develop a one-day professional development session on using interactive whiteboards to enhance mathematics teaching and learning. Details can be found at: Steljes CPD . The MA and Intel worked together to design and produce free materials aimed at KS3 mathematics (teachers and learners) - these consist of a dynamic number line, and an extensive mathematical toolkit - which won the BETT 2006 KS3/4 maths software award - a video is available from Becta. These are written in flash and run in a web-browser. You can download them FREE from Skoool.co.uk via the London Grid for Learning . A new version of the Toolkit v.2 with a clearer user interface and with the facility to save your work and to load preprepared files etc. was launched at BETT 2008 and will shortly be available via the LGfL link. The LGfL also contains a virtual maths staffroom maintained by the MA. The MA advises Teachers TV on the content of its mathematics programmes, working with the Glasshead production company. You will need to register (free) in order to be able to download any of the extensive library of programmes and resource reviews. I am also working with colleagues from the University of Chichester and the MA on the development of the BETT 2005 award winning RM MathsAlive! from KS3 to GCSE, called Discover Alive. We are also working with the 3T production company on 3 of the KS3 maths case studies as part of the DfES/Bowland initiative. Hampshire LEA is running a project on using ICT to enable collaborative cross-curricular work in maths, science, D&T and related subjects, including Sports/PE. The project is directed by Ron Taylor, Hampshire maths inspector, and I am very glad to be supporting it. It is part of the Microsoft and TDA `Partners in Learning' programme, and is based on 5 specialist schools in the Fareham & Gosport area of Hampshire. The project has its own website where you can find out more about it. Materials and case studies developed through the project will be disseminated through the Microsoft Innovative Teachers programme. You might be interested in applying for an award under that programme. The winner of the BETT 2007 award for secondary core subjects was Cabri 3D, with TI SmartView as the other shortlisted maths software. Becta have also made a video of Cabri 3D. You will find more information about Cabri 3D, other dynamic geometry software and TI software on other pages on this site. I have written a 10 chapter "Cordon Bleu" cookery course on using Cabri 3D for the Count On website, which is also mirrored on the MA site. So far 5 instalments have been published. The future of the Count On site is currently under discussion with the DfES and the National Centre for Excellence in Teaching Mathematics - I hope there will be more news soon about how you can access the remaining instalements. The photos here are of Alison Clark-Wilson and me at the BETT 2006 awards, and of Jean-Marie Laborde - father of Cabri - relaxing at Ronnie Scott's after the BETT 2007 award. I'm also a member of the UK steering group for the Teachers Teaching with Technology CPD programme administered by Texas Instruments. If you want support and/or training on TI hand-held technology, such as graphical calculators and data-loggers, and/or TI software then you should contact T-cubed to arrange for free on-site training. You can also borrow free of charge any of the equipment from their Workshop Loan Programme. You will also find useful materials such as a booklet and a guide to which exams permit the use of graphical calculators. Now the inevitable plug for my current publications! 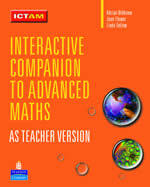 The Interactive Companion to Advanced Mathematics (ICTAM) by Jean Flower, Adrian Oldknow and Linda Tetlow is published by Longman (Pearson) - see the website at ICTAM . It is a CD which comes either in a school/college licence version, or a student version. The idea is that a student taking the core AS/A2 pure units will have a teacher, a textbook and past-papers, and probably own, or have good access, to a computer and/or graphical calculator. The materials relate the core content to interesting and realistic applications, and the CD contains a wealth of pre-prepared files in Excel, Sketchpad, Cabri, TI InterActive! etc. as well as help in using graphical calculators, videos of how to use the software packages etc. 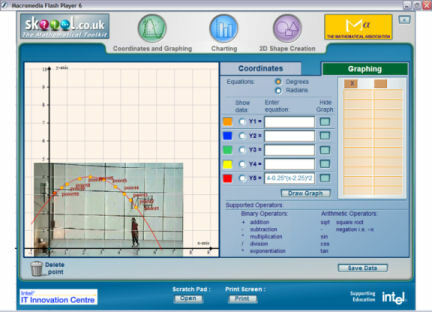 There is also a self-contained java applet called Tool for Interactive Mathematics (TIM) with provides the user with their own powerful graphing tool. 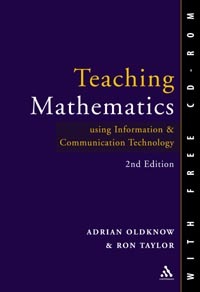 Teaching Mathematics using ICT - Oldknow & Taylor, Continuum 0-8264-7059-9 is the second edition of our (very well reviewed) book - it is now available at £19.99 from Amazon with free CD-ROM - as you can see above it kept the then Secretary of State for Education, Charles Clarke, absorbed at the BETT show 2004! Adrian is Emeritus Professor of Mathematics and Computing Education at the University of Chichester, and visiting fellow at the London University Institute of Education. He chairs the Mathematical Association's ICT subcommittee, is a member of its Professional Development Committee and a member of Council. He is Treasurer of the Joint Mathematical Council and a member of ACME's `Outer Circle'. Recent work includes editing the report "Teaching and Learning Geometry 11-19" for the Royal Society ISBN 0-85403-5656, writing the book "Teaching Mathematics using ICT" with Ron Taylor for Continuum, editing the MA's Guidance in ICT and mathematics in secondary schools and producing the Longmans ICTAM packs. He is strongly committed to making mathematics a more exciting and interesting subject for teachers and learners, and has particular interests in ICT, geometry, mathematical modelling and in cross-curricular work. He also dabbles with mathematics in an amateur fashion and has made some exciting discoveries in 2D and 3D geometry aided by dynamic geometry software. 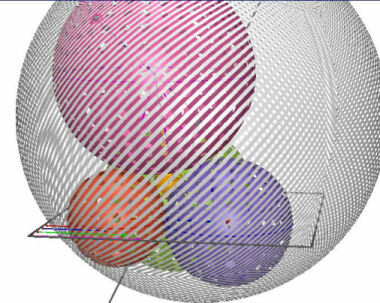 For example, using Cabri 3D he has made some remarkable discoveries in the geometry of the tetrahedron, working with Michael Fox, John Rigby and Sir Christopher Zeeman - which should shortly be published. The image at the top of the page shows a 4-ball tetrahedron with the inner and outer Soddy spheres.